Celebrate Luther Vandross' Birthday on April 20th with the Atlanta All Star Band featuring Vocal Sensation Mr. Danny Clay at the Rockdale Auditorium. One night only! Doors open at 6:00 pm for an evening filled with the legendary Luther Vandross hits performed live! Advance tickets are $20 and $25 at the door. The Rockdale Auditorium is located at 903 Main Street, Conyers, 30012. For more information, call the Johnson Park Recreation Center at 770-278-7529. 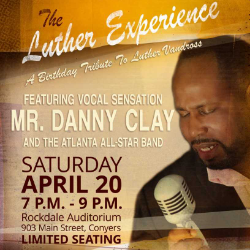 Celebrate Luther Vandross' Birthday on April 20th with the Atlanta All Star Band featuring Vocal Sensation Mr. Danny Clay at the Rockdale Auditorium. One night only! Doors open at 6:00 pm for an evening filled with the legendary Luther Vandross hits performed live! Advance tickets are $20 and $25 at the door. The Rockdale Auditorium is located at 903 Main Street, Conyers, 30012. For more information, call the Johnson Park Recreation Center at 770-278-7529.